Omega 3 fatty acids are some of the most important nutrients you can put in your body. Not only are they extremely anti-inflammatory, but they actually make up some of the most important structures of your body like your brain and nervous system. Not getting enough in your diet increases your risk of many chronic illnesses so it is important that you understand the benefits of omega 3 fats. This is something that if someone asks me, “Hey what are the MOST important supplements to take on a daily basis?” I absolutely recommend. Along with things like magnesium, Vitamin D, clean water, and an anti-inflammatory diet; omega 3 absolutely cannot be overlooked. Omega 3 fatty acids are what is characterized as long-chain fatty acids. The 4 main types of these are ALA, DPA, EPA, and DHA. We are going to primarily focus on EPA and DHA as they are most commonly deficient while being the most important for overall health. 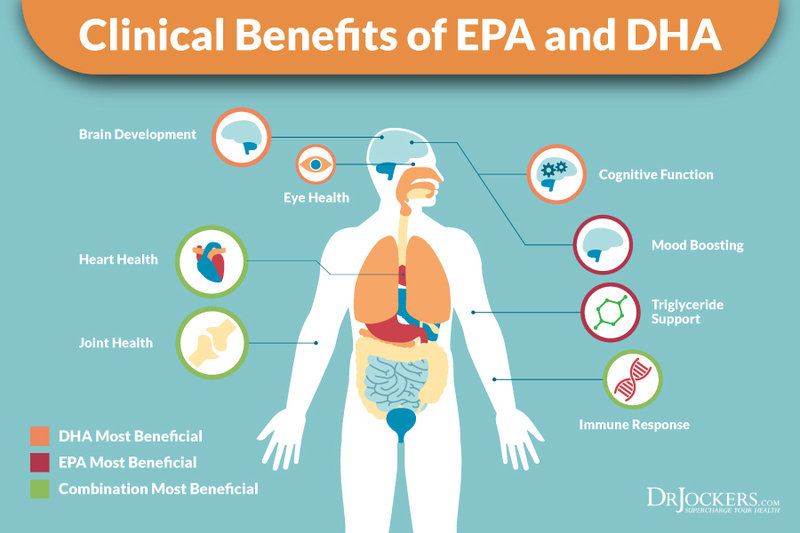 EPA and DHA are derived from mother’s milk, algae, fish, and grass -fed meat products. EPA and DHA can be synthesized in the body from ALA, however it is a very inefficient process and can put excess stress on the liver. ALA is derived from plant sources of omega 3 such as green plants, flax, chia, hemp, pumpkin seeds & walnuts. As with many things in the body, fats are the most beneficial when consumed in proper ratios. When talking about omega 3, the most important balance to consider is omega 3 fats in relation to omega 6 fats. Omega 6 fats are important for inflammatory processes in the body, however consuming too much in relation to omega 3 can become excessively inflammatory. This inflammatory imbalance between omega 3 to omega 6 is extremely common in today’s society. 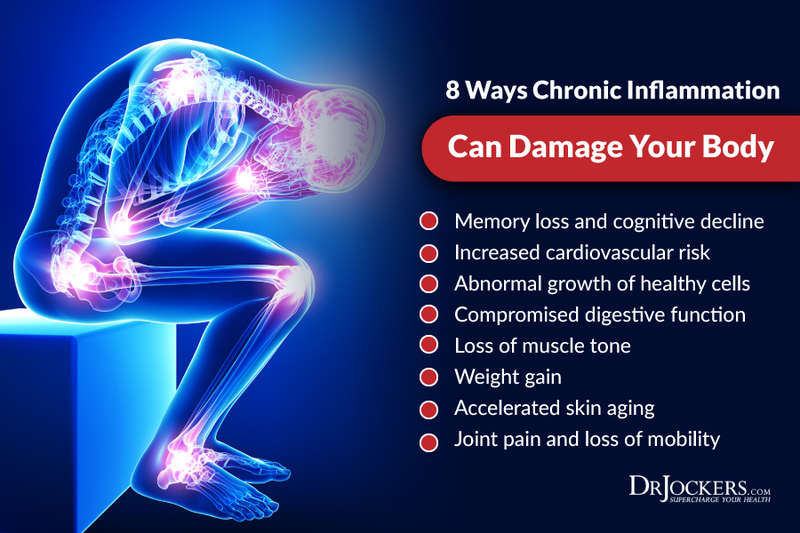 For many other reasons, chronic inflammatory diseases are at an all-time high. This makes it imperative that you start employing anti-inflammatory nutrition and lifestyle principles. Increasing your intake of omega 3 fatty acids is an important step in this process. One of the most important roles of omega 3 fat intake is that our cells actually need these fats in order to function properly. Every cell in the body is made up of a combination of cholesterol, saturated fats, and polyunsaturated fats. The saturated fats and cholesterol help to maintain the structural integrity of the cell membrane while polyunsaturated fats allow fluidity. This fluidity is important for the transportation of materials, cellular communication, and other processes that occur across the cell membrane. 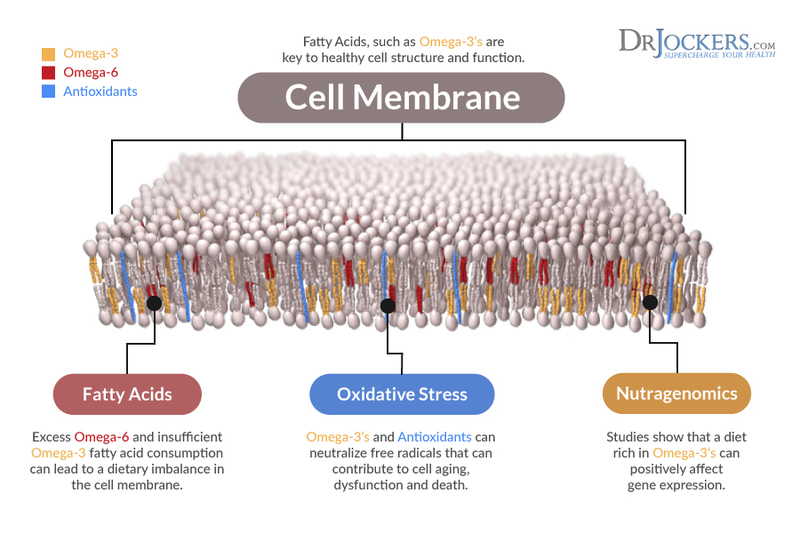 You may not have known this but the polyunsaturated fats that make up part of our cell membranes are actually the omega 3 fats EPA and DHA (1). Depression and anxiety have been associated with something called neuroinflammation. This just means inflammation in the brain. Because increasing omega 3 intake can be highly anti-inflammatory, this could make it an important consideration in anxiety and depression. Additionally, there have been several studies demonstrating the effectiveness of EPA and DHA in mitigating depressive symptoms (2). Finally, there is some evidence showing that lower levels of omega 3 fatty acids are correlated with higher levels of corticotrophin-releasing hormone (CRH) which is normally released in response to stress. Chronically elevated CRH due to inadequate omega 3 intake could contribute to depressive or anxious feelings (3, 4). Some preliminary evidence from a study published by Oxford in 2014 suggests that higher levels of dietary omega 3 intake are associated with lower instances of insomnia and less interruptions in sleep (5). Considering the anti-depressive and anxiolytic effects mentioned above, it is realistic that omega 3 fatty acids may help one get a better night of sleep. Another factor to consider is that chronic inflammation can have a detrimental impact on sleep quality due to increased levels of circulating stress hormones. Omega 3 intake can help to mitigate inflammation and improve sleep by lowering associated stress hormones. DHA is particularly important for development and maintenance of eye health. DHA is found in high amounts in the retina where it plays important roles in maintaining photoreceptor membrane integrity and ensuring optimal production of vision through light transmission (6). Inadequate omega 3 intake has also been associated with conditions of dry eyes and poor eye structure development in children. Finally, low intake of omega 3 is associated with increased rates of macular degeneration and retinopathy. Dietary carotenoids are also incredibly important for protecting your eyes from degeneration as illustrated below. 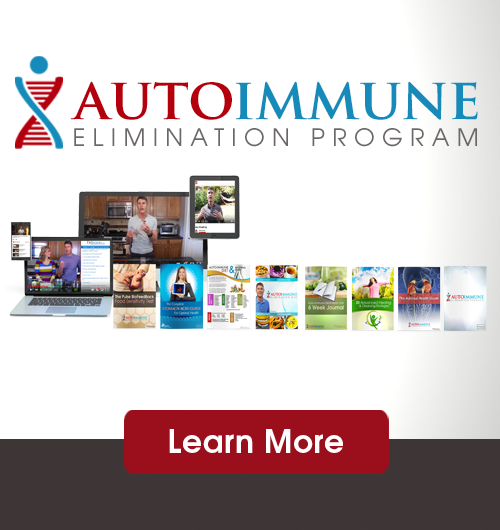 Poor immune function is often a result of chronic inflammation. 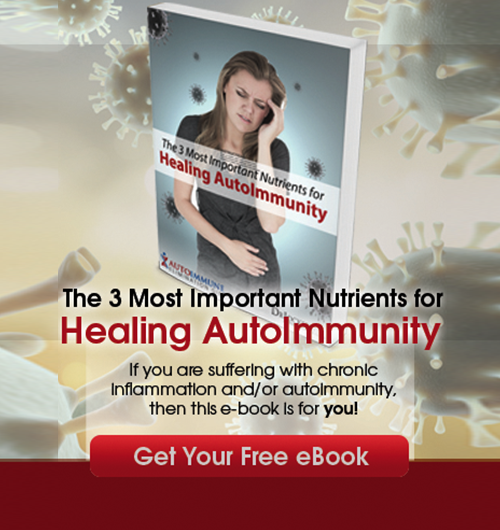 Especially in cases of autoimmunity (overactive immune system), targeting underlying inflammation is extremely important for improving immune function. Increasing your intake of omega 3 fats is critical for this process. In fact, a study performed on children up to the age of 3 showed that adequate DHA early in life is important for lowering instances of allergies and upper respiratory infections (7). Omega 3 fatty acids, particularly DHA, are incredibly important for the development of healthy brain tissue. Adequate omega 3 intake has been shown to provide benefits such as improved cognition, lowered stroke risk, improved cerebral blood flow, improved ADD/ADHD symptoms, reduced migraines, and decreased risk of neurodegenerative diseases such as Alzheimer’s and Parkinson’s. As you can see, DHA intake is always important for ongoing brain health. It is critical that DHA needs are met during the developmental stages of a child’s life, particularly in the womb. As the brain undergoes rapid development, the mother will actually shed excess DHA stores in the body in order to support her child. If there is not enough, the child’s development may be significantly inhibited. Adequate omega 3 intake is important for optimal bone health. Like several of the conditions listed so far, poor bone health is associated with chronic inflammatory conditions in the body. 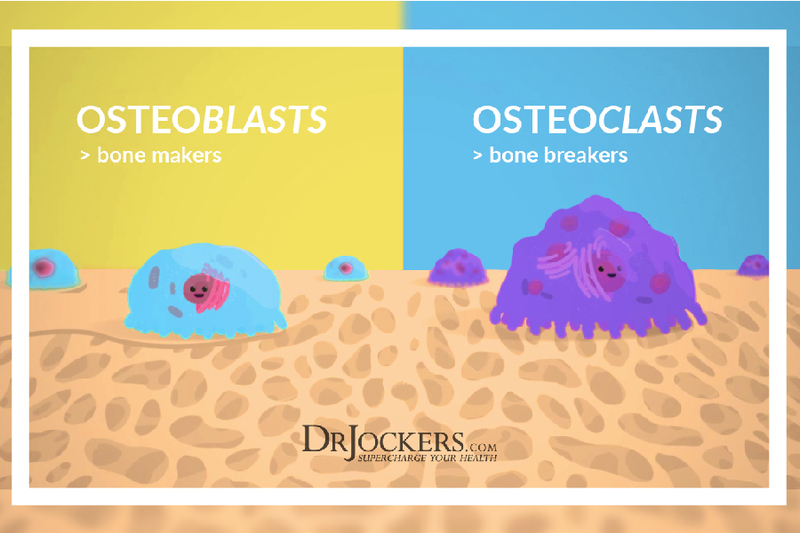 This is the first and most foundational benefit of increasing omega 3 intake for bone health. Additionally, omega 3 intake may improve bone health by helping to regulate calcium balance and osteoblast activity. Mostly animal-based studies point towards the importance of DHA for bone health (8). Once again, fish oil’s ability to mitigate inflammation has a powerful impact on the development and progression of cardiovascular diseases. One of the primary heart conditions, calcification of the arteries, is heavily influenced by inflammation and improper calcium metabolism. As has been mentioned briefly, adequate omega 3 intake helps to promote healthy calcium metabolism. The anti-inflammatory benefits of omega 3 fats further promote heart health by helping to prevent the oxidation of the artery lining and cholesterol. Studies have shown that fish oil can lower the risk of dying from a coronary heart disease event. Omega 3 fats also improve cholesterol, triglyceride values, and may help to lower blood pressure in some cases. If you have not noticed by now, one of the most fundamental benefits of increasing your intake of omega 3 fats is that profound anti-inflammatory effect. Because inflammation is at the root of almost all chronic diseases of modern times, this benefit is highly sought after. 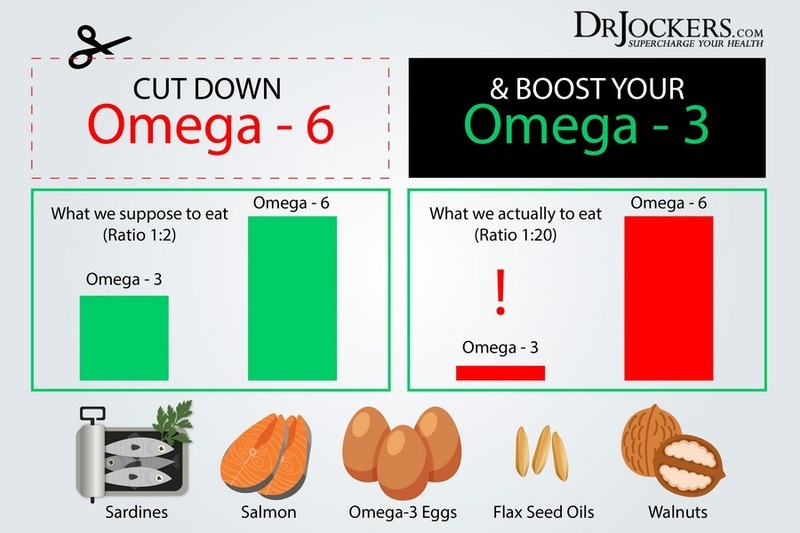 For any of my patients who are suffering from a chronic disease and struggling to get well, increasing omega 3 intake is always a core strategy. Studies have shown that a higher intake of omega 3 fatty acids can prevent or at least slow the progression of many chronic inflammatory disorders such as autoimmunity or neurological disorders. My experience working with people is that this strategy can be very beneficial. Now that you understand the many benefits of increasing your intake of omega 3 fats, it’s time to learn the best sources. First and foremost, getting plenty of EPA and DHA from food-based sources such as wild-caught fish and algae grown in a clean-controlled environment, is the absolute best. Some of the top sources include sockeye salmon, sardines, mackerel, and algae. There can be some conversion of ALA into DHA from foods like walnuts, flax, and chia. Conversion of ALA into DHA is typically not enough to reach optimal levels however. In addition to consuming fish or high DHA algae on a regular basis, it can be helpful to take an omega 3 supplement concentrated from fish or algae if you are a vegetarian/vegan. For therapeutic applications, taking in about 2-4 grams of omega 3 from EPA and DHA can be very beneficial. It is in this range that I have noticed my clients get significant improvements in inflammatory markers and they notice other improvements in their overall wellbeing. Nordic Naturals is my number one brand as they are concentrated and are held to extremely high-quality standards. For everyday use, Pro Omega or Pro EFA are my go-to choices. For people dealing with significant inflammatory conditions, Pro Omega CRP is one of the most effective supplements I have discovered. Omega 3 fatty acids are vital to your health and wellbeing. Every single cell in your body and especially the tissues of your brain require omega 3 fatty acids in order to function properly. The two most important that are often deficient in people today are EPA and DHA which can be derived from fish and certain types of algae. Daily intake of omega 3 fats should range from 1 gram daily (daily maintenance) up to 3-4 grams per day for significant health challenges rooted in chronic inflammation. It is important to be sure you get a high quality purified fish oil that has removed any possible contaminants and is in the triglyceride form for optimal absorption. This is why I really like the Nordic Naturals brand. Your brain is under attack — disorders like depression, anxiety, headaches, ADHD, memory loss, epilepsy, dementia and other neurological disorders are MORE prevalent than ever before. What is “superhuman?” 99% of the population is focused on treating the symptoms of brain-based diseases and disorders. Remarkably, the 1% who focus on cultivating a healthy, high-performing brain often see symptoms disappear as a side effect of getting healthy and restoring function. Choose to live ABOVE the status quo by addressing brain health from a different perspective… with superhuman upgrades! The Superhuman Brain Masterclass will give you access to the upgrades you’ve been looking for: maximized memory, exceptional focus and greatly productive brain function. When you join me for this FREE MASTERCLASS, you’ll learn the Superhuman Brain proprietary methodology, a world-class education with simple checklists, step-by-step solutions and little-known protocols that invite healing, brain upgrades and next-level performance. The Superhuman Brain Masterclass is online and free from December 3-9, 2018! Will you deliver to Chiang Mai, Thailand…better yet…are you enjoying international sales and specifically, SE Asia? I so much appreciate Dr. Jockers amazing articles which are presented in such an easy format to read. I have been in health and wellness since 1968 beginning with Shaklee in the USA. In my view, it is not necessary to increase the omega 3 intake! Before 1930, the macular degeneration was a medical rarity: 192 cases worldwide. By 2020, there will be 196 million cases. So we just have to go back 100 years with our diet. At that time only 1.8 grams of omega 6-containing vegetable oils were consumed per day, today it is 40 times more (70 to 80 grams). If you eliminate polyunsaturated vegetable oils, corn, wheat and soy products from your diet and instead use coconut oil and animal fats from grass fed animals, everything is OK. Awesome source, God bless the team & Dr jockers. Can kids take Promega by Nordic Naturals? ?